The purpose of this Help Center is to give malpractice and accident victims a detailed understanding of what to expect in accident and malpractice cases. We provide more real information here on Maryland personal injury cases from the victim's perspective than you will find anywhere on the Internet. Sure, you can find it elsewhere on our website, but you will not find us here bragging about million dollar verdicts or our satisfied clients here. Instead, you will find volumes of information about how the system works in Maryland to handle accident and medical error claims. We provide a full explanation of what you can expect at trial in each county (and Baltimore City) and give detailed knowledge on what to expect from almost every insurance company handling traffic collision and medical error claims. We also provide information for lawyers on our Lawyer Help Center. If you were serious hurt in an accident, you are almost invariably going to be confused about what to do. Yes, there is a rush to move your case forward. There is much to be done. But take a deep breath, relax, and spend some time trying to figure out the best path forward for you. This is important. You want to measure twice and cut once. We think this page will both educate you and point you in the right direction. We don't handle lawsuits in cases where the plaintiff demands less than $30,000. But we used to try these cases. Here is how they go. Am I required to report an accident to the police or my insurance company? How much can you recover and how do they work? Every state is different. This is an excellent summary of our law. Get the inside scoop on how to handle particular insurance companies like GEICO, State Farm and Allstate. General information about truck crash cases. 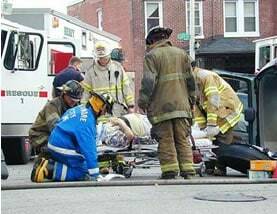 What to Do After a Vehicle Crash? Insurance companies always win the property damage claim. Always. Here is how to make the win a little less. Do you really need a lawyer? If not, how do you move forward? What to do and what the challenges will be. If you are injured in a serious accident or are the victim of medical malpractice, contact our team of lawyers to discuss your case. If you have any questions for us, you can reach us at 800-553-8082. You can also get a free on-line consultation/case evaluation.